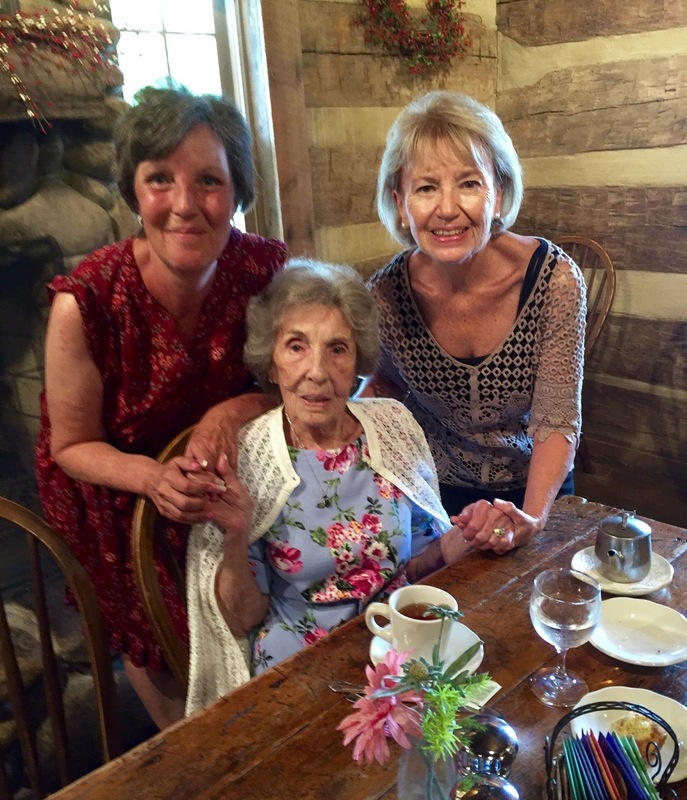 I recently went to Ohio to celebrate my Mom's 88th Birthday. That's my sister, Amy, on the left with my Mom and I. 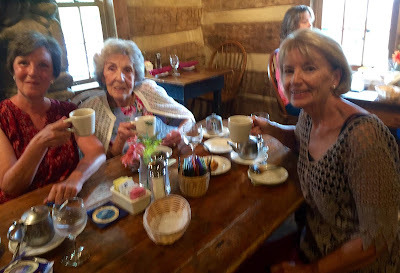 We took her to the Morgan House, and had a wonderful lunch. Isn't my Mom so cute? She bought this pretty dress to wear for her birthday lunch, and then before I left for home, she gave it to me! 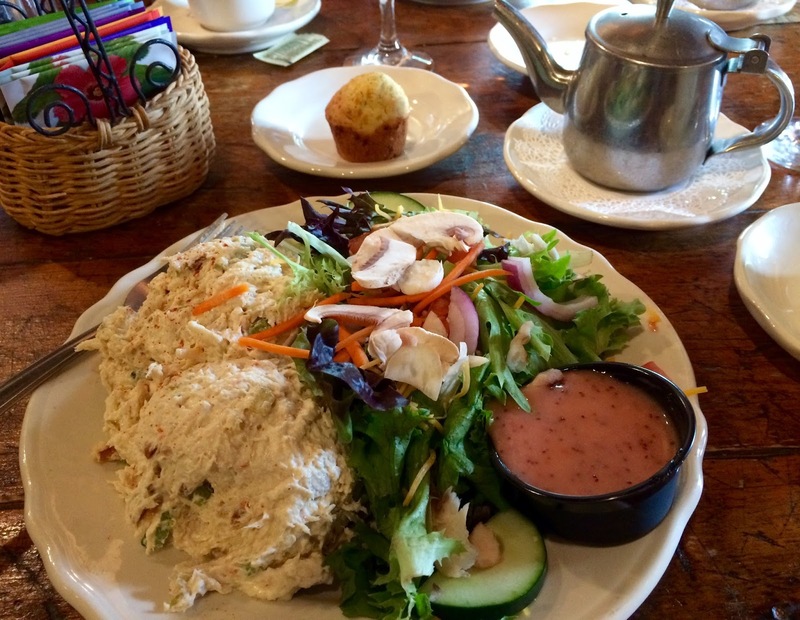 Here's a picture of my chicken salad, with a side garden salad with a fresh strawberry dressing. We each had a pot of tea, and I chose Blackberry Sage, Mom had Apricot, and Amy had Wild Blueberry. Look who showed up to meet us!! My friend, Michele, from The Nest at Finch Rest, surprised us!! I had texted Michele to tell her where we were going, hoping that she could come by. Michele and I have always wanted to meet in person. Of course, we already knew each other well from blogging, but meeting in real life was such a treat. My Mom and sister loved Michele right from the start, and she stayed and had a pot of tea with us. Michele was too kind and brought my Mom a gift that she had made, with the instructions to open later. Here's Mom at home, opening her gift from Michele. 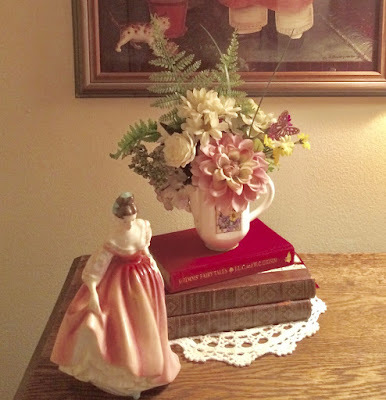 The gift was a darling pitcher (which my mom collects) with a pretty floral arrangement. Wasn't that sweet of Michele? I placed it on my Mom's nightstand. My Mom always wants me to make her an angel food cake with her favorite Speedy Meringue Frosting. 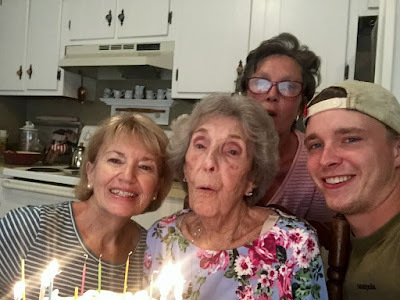 Singing Happy Birthday to this sweet lady! My Mom and I had a day to spend together because my sister had to work. I was down in the basement doing some laundry and this quilt and sham set was calling to me. I brought it up to see if mom would like to change out her quilt on her bed, and she did. It gave her a pretty summery feel to her room. 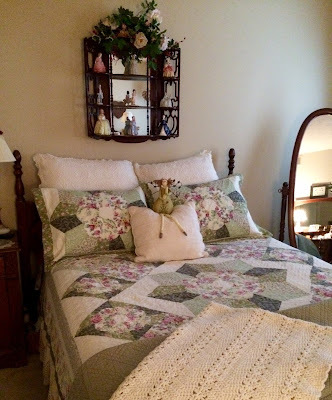 The green quilt at the foot of the bed was found down in the basement, too. Yes, it was such fun shopping the house! One evening we did the fun tiles that my son, Mike, and I had done this summer with the grands. 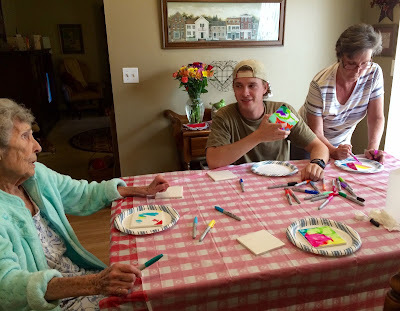 My nephew, Shane, joined in for the fun project. He was so sweet and asked to create one together with his grandma. the bouquet of flowers behind Shane were a gift from him to his Gram. Happy 88th Birthday to my beautiful Mom, sitting on her pretty patio. I was so happy to be able to share her birthday with her! Now I am off to Breckinridge, CO, to vacation with my youngest son, Kevin, DIL, Kristen, and granddaughter, Harper. What a beautiful lady your mom is! And such sweet pictures of you and your sister with her! So generous of her to give you the dress she wore, I know you will always treasure it! How wonderful that you got to be there to help her celebrate her birthday! I think the new quilt on the bed looks very summery and lovely :) Have fun in Colorado! A delightful post, you're mother looks so happy. And she received some lovely gifts but probably the best one was spending time with her family. I hope you enjoy the rest of your break. Your mom is definitely a beauty! Happy Birthday to her. I'm so glad you had a special visit with her and your sister. What a bonus to meet Michele in person. Isn't blogging neat? Happy belated birthday to your beautiful mother! She is one pretty lady, which accounts for her having you and Amy. They grow'em pretty in your family. And, bless my soul, how wonderful to find Michele here! I was getting ready to put an all-points bulletin out on her. 😉 She is one of the most thoughtful gals in Blogdom for sure. Thank you for sharing the family photos and activities. Shane is an extra-special young man! Aw, Happy Birthday to your beautiful mom! What a wonderful gathering for her birthday! That pretty floral dress is going to look sweet on you, Kitty. The cake looks lovely and so does Michele's gift for your mom. Sounds like a really delightful celebration for everyone. Enjoy CO.
Oh my gosh I found my mother's doppelganger.! 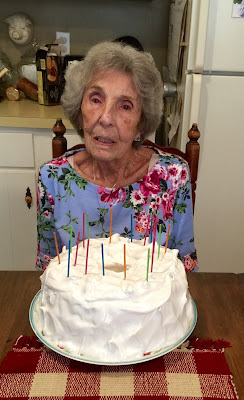 My mother just turned 91 and when I saw your mom's picture, I honestly thought it was my mom. God bless your mom and thanks for sharing! Hi Kitty, Happy 88th Bithday to your beautiful mother. What a special birthday celebration. She is adorable and her birthday dress so pretty. How sweet she passed it on to you to enjoy as well. Love the photos of you, your mom and your beautiful sister. Your lunch looks so special and then to meet Michele too is a wonderful surprise gift. 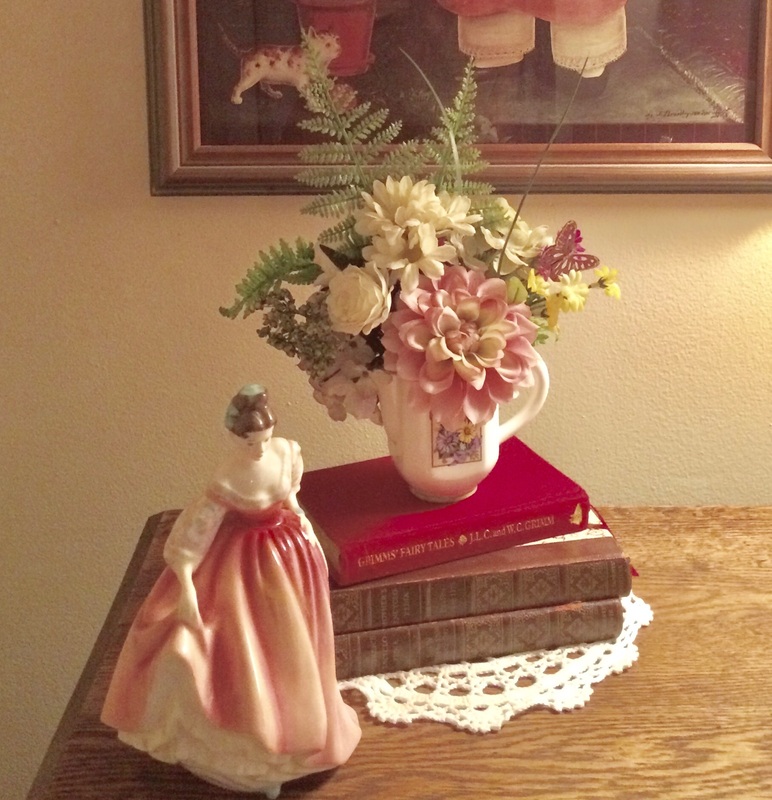 How sweet of Michele to gift your mom with that beautiful pitcher and flowers. Love it with the summery quilt you added from the basement. Isn't it amazing what we find when we shop the house. Glad you all had fun with your tile project too. So sweet of your nephew to bring flowers and join in. Have a wonderful time in Co. with your kids and grand. What a special time for your family Kitty! I hope your travels leave you refreshed and renewed from being with family! Hello Kitty, Happy 88th Birthday to your sweet mom! It looks like you had a great time celebrating with her. It was really nice for you to meet your blog friend too. I hope you have a fun time visiting with your son also. No wonder you are so pretty with a great figure dear Kitty! Your mom is gorgeous and who wouldn't want to have that figure still ! 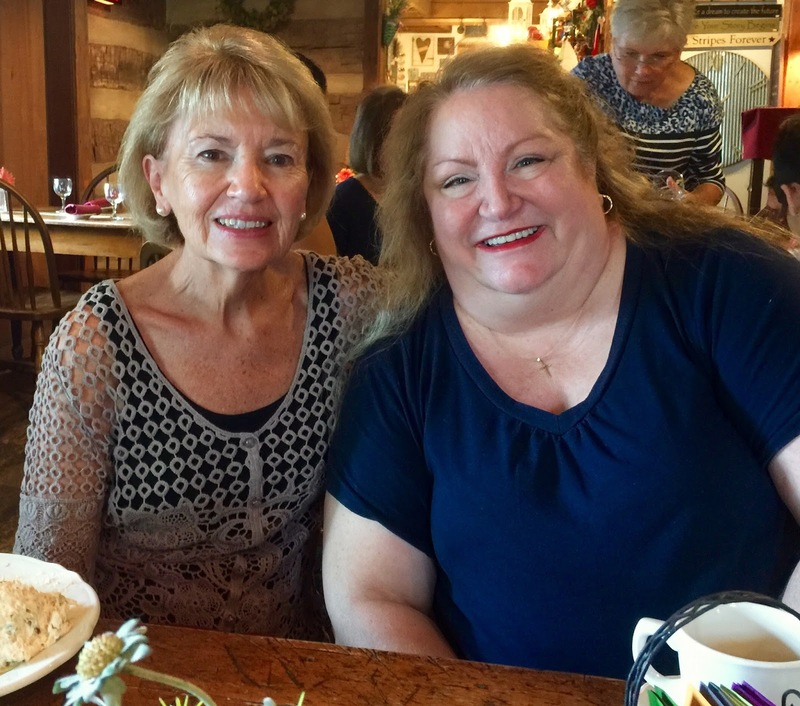 What a great surprised you had meeting with dear Michelle and your dear sister; an awesome birthday luncheon! 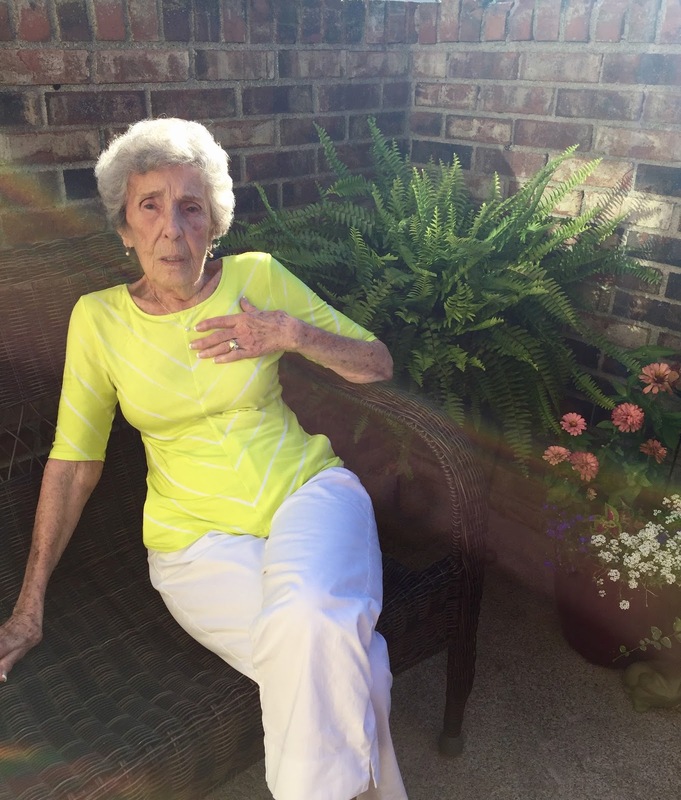 My mom will be 88 this December 27th. as well. God bless her and keep her well. Happy Birthday to your darling Mom! How blessed you are to still have her. Treasure each moment. What fun that you were able to meet Michele in person. I enjoyed my visit and loved seeing pics of your precious mom. By the way, my Mom was from Ohio too. Happy birthday to your beautiful little mother. You are so fortunate to still have her. How exciting to meet another blogging friend. Happy belated 88th birthday to your Mom! I'm so glad she was able to celebrate her birthday with you and the lovely Michele! I would totally wear the pretty floral dress (is it purple?!?) and the yellow blouse. Enjoy your vacation in Colorado! It was a pretty blue - the lighting is low in the Morgan House. That dress was absolutely gorgeous. Kitty and her sister and mom and so pretty and tiny and sweet. What a blessing to meet them! What a special day/celebration for your Mom! I'm going to meet a blogger this month. She is coming to my home from CA & will stay for a few days! Enjoy your visit. Happy Birthday to your mom! Tell her She looks terrific! How very sweet to meet Michele (her coming was, in itself, a gift! ), and for her to bring your mother a gift. I told my sister and another friend about that tile craft - such a great idea. And your mom's room looks nice and summery. Enjoy the rest of your travels! Happy Birthday, Miss Kitty's Mom!!!!!!!!!! You look like a million bucks and change!!! So cool of Michele to make it to your Mom's birthday celebration, Kitty! Happy Birthday to your sweet mom! She is more stylish than me :-) Enjoy your trip to Breckinridge! Kitty, your mom is a beauty! I can imagine what fun you had celebrating with your family and your blogger friend, Michelle. Happy travels! Happy Happy Belated Birthday to your Beautiful Mom, Kitty! She is adorable & SO fashionable. LOVE her (now YOUR) dress!! I am so glad you were able to spend some time with both her & your sister. I miss my Mom...gone 13 yrs. now. How fun to finally meet Michele, a dear friend to several of us and she made your mom a lovely bouquet. I've pinned the meringue frosting as I will be making an angel food cake for a church BBQ pot luck. Does the cake need to be refrigerated Kitty? Thank you for sharing the birthday celebrations and visit with your Mom. She looks fabulous. Happy Happy Birthday to her. How nice that Michelle was able to join you. Great to see her. The quilt and shams you found are beautiful. I know your mother was tickled to have a change. What a wonderful and special day!Happy birthday to your mother,Kitty!Thanks for sharing such happiness!Hugs. Happy Birthday to your sweet mom, and how pretty and cheerful is that yellow and white!? I love that you and Michele met, it looks like you guys had a blast! Happy Birthday to your lovely mom. That is a pretty dress she is wearing. How very sweet for her to gift it to you. Nice that you met Michele and what a lovely thought she gifted your mom. Have the most wonderful holiday in Colorado. Enjoy! Your mom is beautiful! Happy belated birthday to her! What wonderful family times you shared. It is easy to see where to get your beauty from...your mother! Happy Birthday to her! How nice it was that you were able to be there for her big day...and getting to meet Michele as well! She lives very close to my family in Ohio and I will be heading there next week for a family reunion. It will be a quick trip no doubt but would love to meet Michele one day...how fun! Hugs to you, sweet friend! Dear Kitty, How wonderful that you got to go to Ohio to be with your mom for her 88th birthday. I know she enjoyed every minute with you, and you felt the same way. It was a lovely "bonus" to be able to meet Michele in person. I'm looking forward to meeting her myself next month on a weekend trip to Ohio. Hope you have a great time in Colorado with your son and his family. Kitty, Your Mom looks well and enjoying her 88th. It was nice to take her out for a special lunch. I love the cake. I remember as a kid we had angel food cake with 7 minute icing just about every Sunday. Thanks for sharing and have a great day. Sylvia D.
I rarely see a place I've been to before but I just saw one! I have been to the Morgan House! We had friends that lived in Worthington in the 80's and we went there. How special for your Mom. I remember there was a plant nursery place near there that was one of the most creative I've ever seen. They had giant baskets you put in your garden and fill with dirt for raised gardens. I am so thrilled you also met with Michele! How special! Have fun in Breckenridge! Also thank you for sharing and linking! What a lovely post and your mom is simply a beautiful lady (like you and your sister). What a wonderful birthday celebration you had. Your chicken salad meal looked amazing -- and what an added blessing to meet Michele! Kitty, your mom is a cutie; just like you! I'm so glad that she got her angel food cake. :) Also, I love Michele and have hoped to meet her some day as well. She sent me a darling quilt topper last Christmas. She is such a sweet gal! I'm sure that you two hit it off wonderfully. You are both so giving. Thanks for sharing with SYC. I am trying like mad to catch up to missed posts and to find this one from you was such a treat. Oh what a blessing and joy it was to meet you - finally - and your lovely sister and Momma. I don't think we had nearly enough time - do hope we can do this again one day soon. And that invitation to tea at my house is definately a for-sure! Happy Birthday to your Mother! She is so cute. I need to shop my house! Ha! It looks like your visit was extra special. So glad you got to meet Michele, too. Happy Tea Day! OH what precious memories you made. Glad you took such great photos. You will cherish them. Looks like a wonderful time was had by all, Kitty. Your mom is so glamorous! Oh my -- this made me cry. Do you know how fortunate you are to have such a beautiful mom and family and that you all have such a lovely relationship? I can't imagine how fun that visit was and your mom is absolutely BEAUTIFUL! How sweet that she bought that dress and then gave it to you. It caught MY eye right away -- love it! Glad you had such a special time. Your mom looks lovely, Kitty, and so elegant. I'm glad she had such a fab birthday. Happy Birthday to your sweet Mom. She is so cute. Am so glad you all got to be together and enjoy the day!